Garden decking can provide the perfect setting for any number of occasions. From the enjoyment of a book and a cool drink on a warm summers day to a romantic setting with mood lighting for two. For parties and special occasions or to spend time in the company of friends and family. With 16 years experience Premierclean will clean and restore your decking to its original condition. 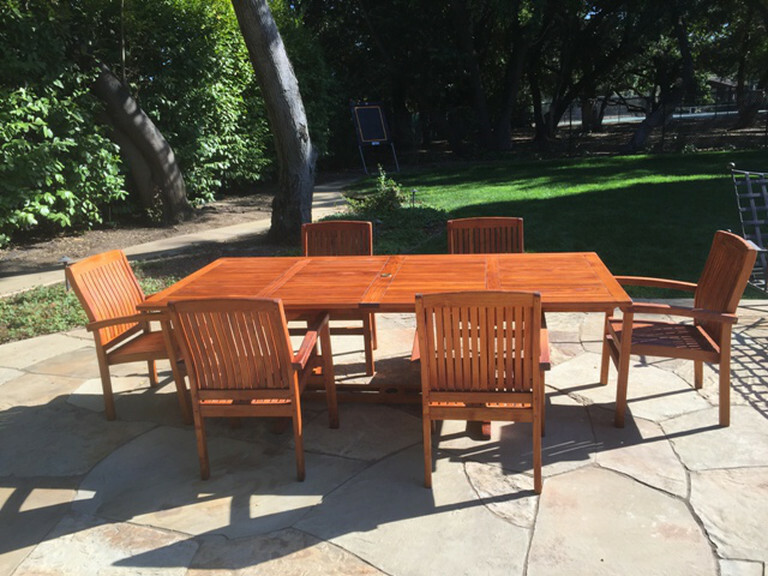 Whether it be regular pressure treated Pine, Cedar, Ipe, Tatajuba, Iroko, Masaranduba or Oak, we will clean it with the appropriate techniques and necessary chemicals. 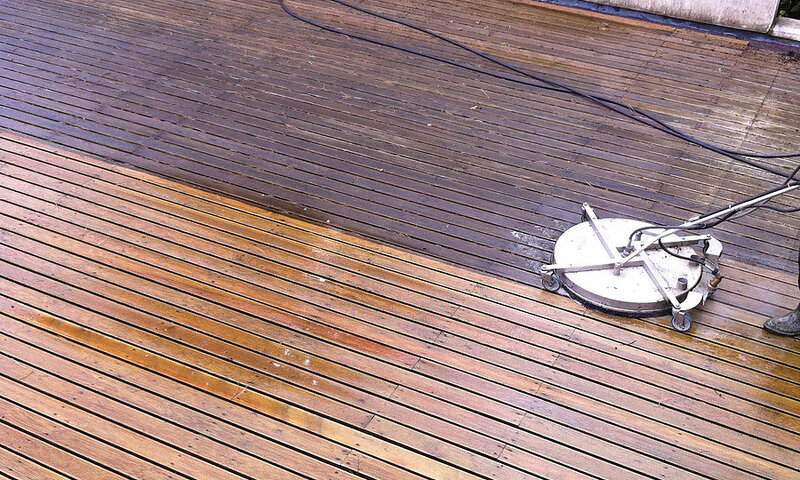 After cleaning, any agreed repairs will be carried out and the deck prepared to receive the selected finish. 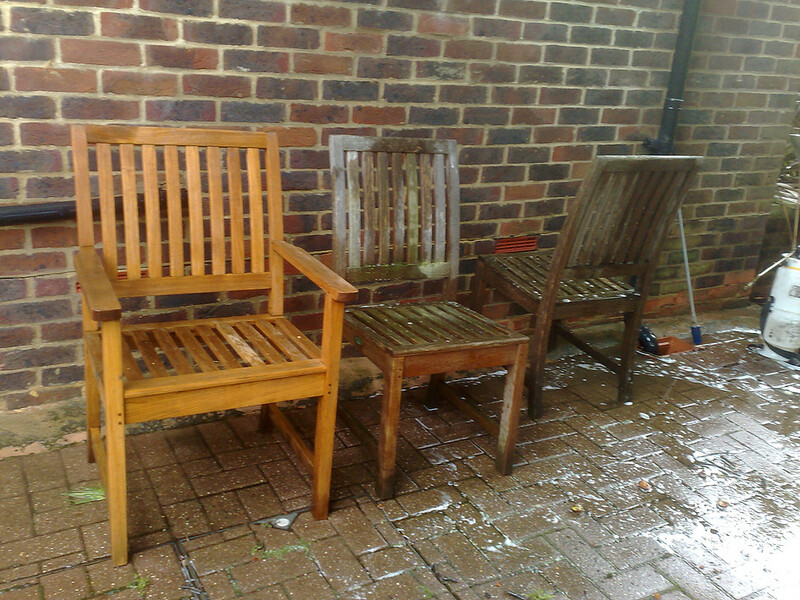 Decked areas can look amazing when well maintained but if left unkempt, can quickly fall into a state of disrepair. 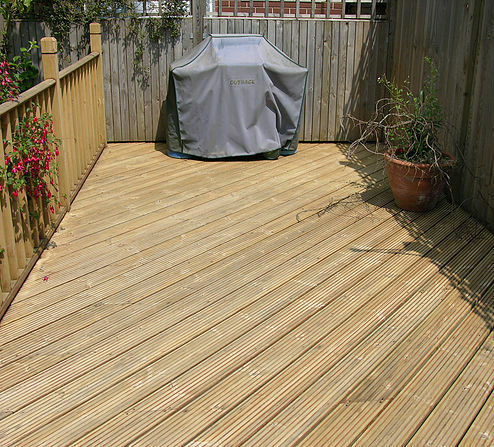 Common issues include the loss of the deckings natural colour, with the decking boards turning grey or silver over time. The build up of moss, mould or mildew that can make wooden decking slippery and dangerous. Or the unsightly appearance of decking finishes that have started to crack, peel and flake away. The good news is that Premierclean can rectify these common issues and decked areas can be restored in no time, to be enjoyed again and again, year after year. Premierclean are experts in assessing and advising (implementing) the correct treatments to restore your decking. Firstly we assess the condition of the decking, the desired look and the treatments required. For example, a south facing deck that takes the full brunt of the sun may need a decking treatment that keeps the wood nourished and protected with UV filters. Decking in a shaded location that is overshadowed by trees or bushes may require better protection from mould and algae due to falling leaves and damp conditions. 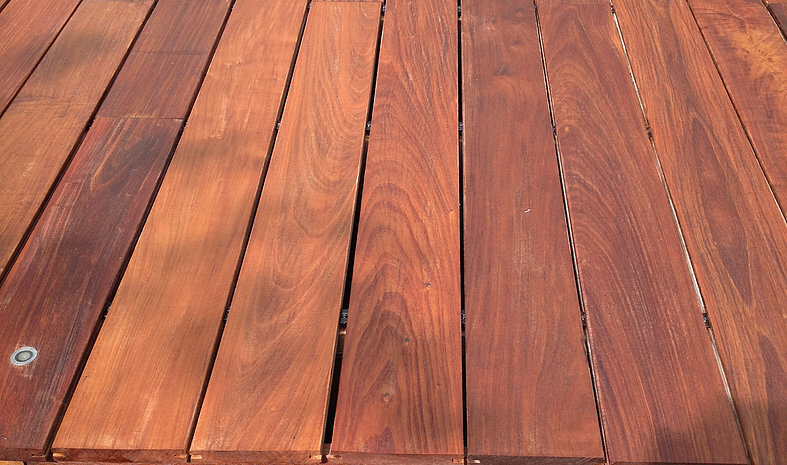 If the decking is bare wood or if it has been treated with a decking oil, stain or other treatment? If the decking boards look dry, grey or silver, then probably they are untreated or not been treated for a number of years. 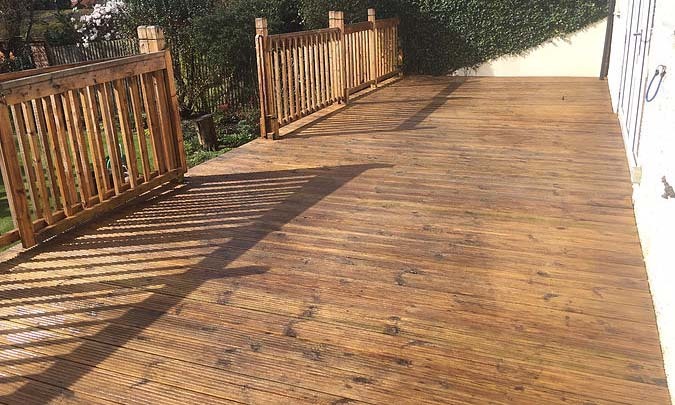 If decking has a varnish like coloured finish, that is showing signs of cracking, peeling or flaking, it has probably been treated with a decking stain. Decking stains tend to form a plastic or varnish like film on the surface of the deck. This said however, some brands of ‘decking stain’ are in fact coloured decking oils that penetrate in to the surface of the decking timbers. If mould, algae or other signs of biological growth are present, it’s probable that the decking is either untreated or that any old decking treatment has worn away or become ineffective. Which decking treatment do you need? Deciding which decking treatment to use can depend on the type and condition of the wooden deck, and what it has been previously treated with, if anything. The best time to undertake this work is in spring or summer, when day and night temperatures stay above 10℃, and dry conditions are likely for 2 or more days. Before treating decking, it’s always best to remove all traces of surface dirt, debris and other contaminates. With a combination of pressure washing and soft washing we remove mould, algae and other biological matter. Old decking finishes that have started to crack; flake and peel can often be removed at this stage. 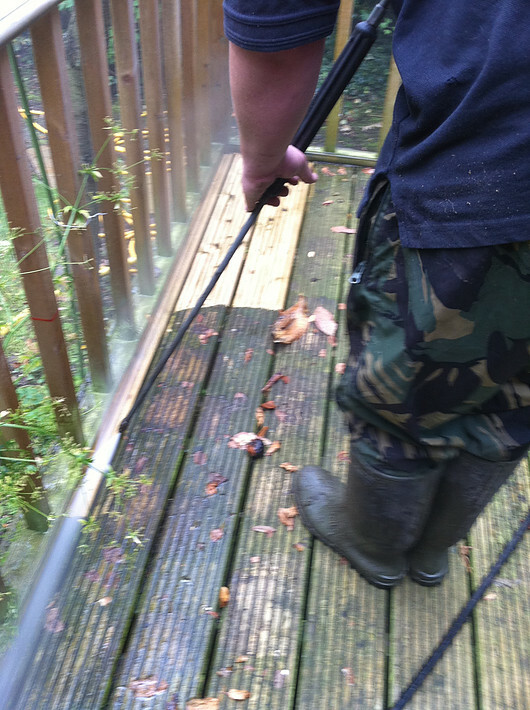 Once cleaned, especially with a power washer, the decking timbers should be allowed to dry thoroughly for a day before applying any treatments. 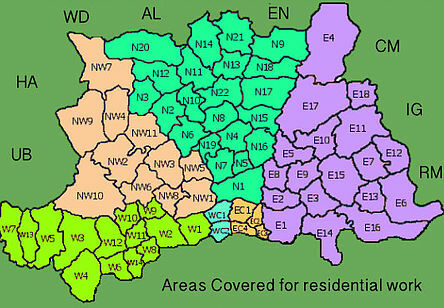 This can depend on weather conditions such as temperature and humidity. 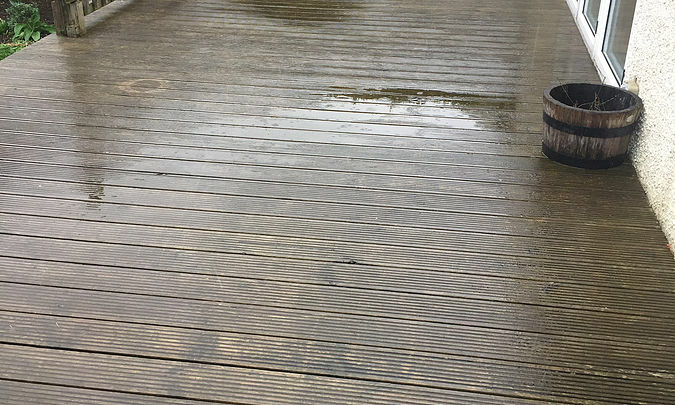 When wooden decking becomes slippery, especially when damp or wet, it’s usually down to mould, mildew, algae or some other form of biological growth on the surface of the deck. 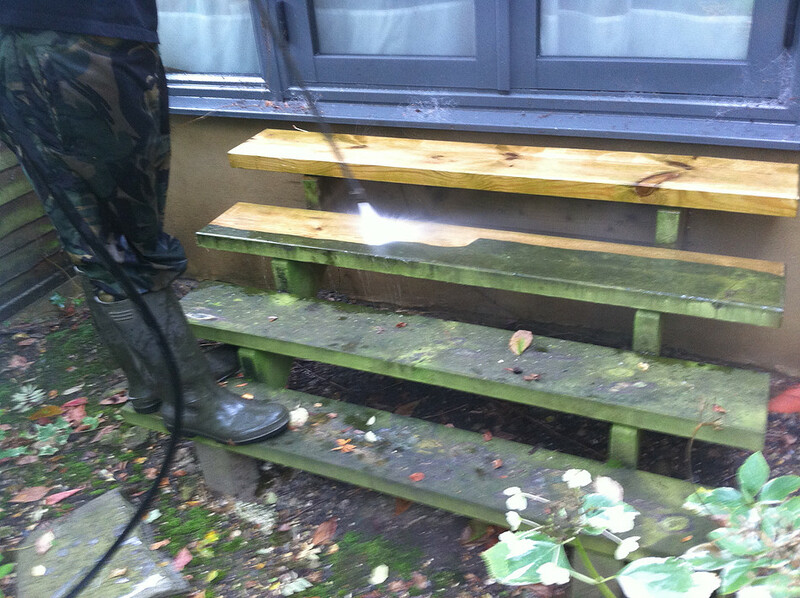 Jet washing will remove the surface matter but will leave the mould spores in the surface of the deck timbers. Left untreated, these are likely to grow back quickly in the right conditions. To kill off mould spores and remove any black staining from the wood, we recommended a fungicidal wash. 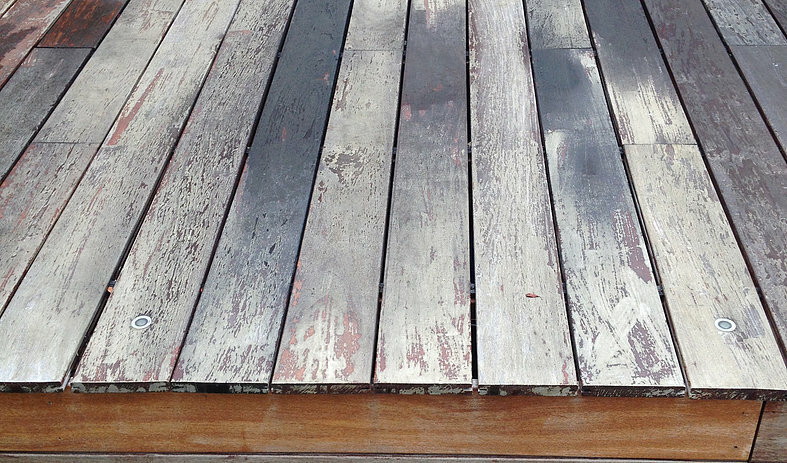 Wooden decking that has turning grey or silver over time can be treated to restore the colour of the timber. Grey and silvering of exterior timbers is caused by UV ray and water damage. 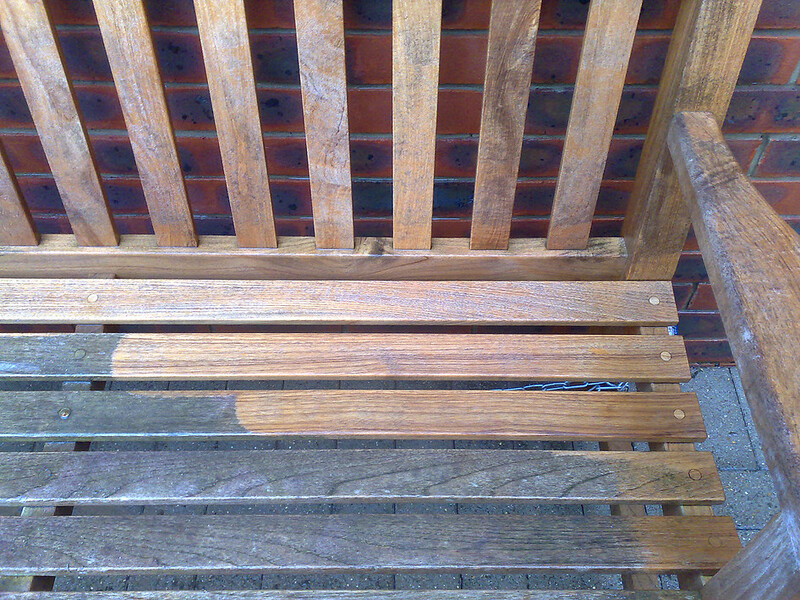 Using tried and tested methods we can reverse this chemical reaction, therefore returning the colour of the timber. Decking that has been previously oiled should be fairly straightforward to restore. After a thorough clean we will apply the appropriate decking oil. 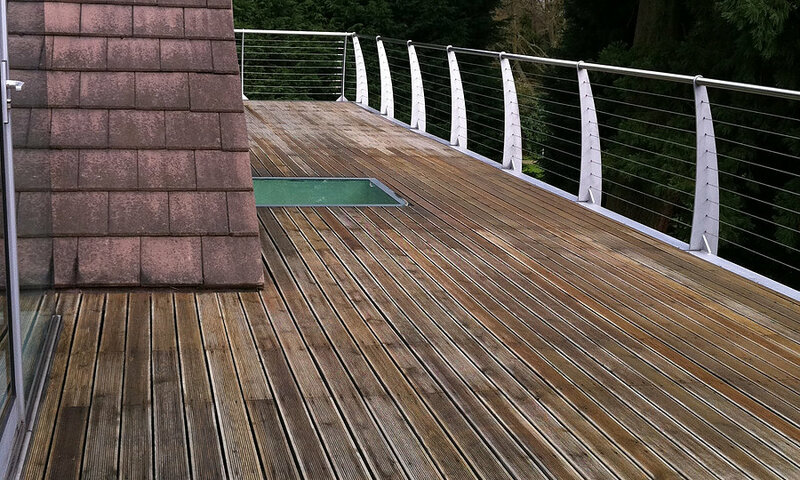 Decking oils are available in a wide range of types from clear to coloured. Decking oils with anti-slip properties are perfect for decking steps or decking at commercial premises such as pubs and holiday camps. Dense Hardwood decking boards made from Ipe, Balau, Garapa and other exotic hardwoods are much more resistant to wood rot and insect attack than the softwood alternatives. 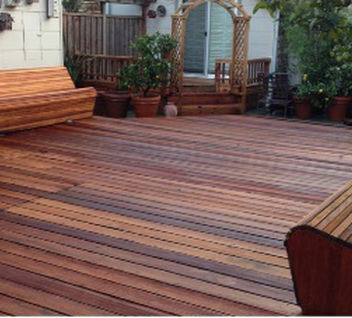 The exotic hardwood timbers used for decking are naturally dense and oily. This is great in terms of durability and resistance but also presents its own issues. Surface coatings such as varnish like decking stains and paints may not adhere or bond well to the surface of the deck if the wood still contains a high degree of oil. Some common brands of decking oil maybe too thick or viscous to effectively penetrate the tight grain of the decking timber, there are however highly refined decking oils we use that are extra thin and penetrate the wood. These speak for themselves. Wood preservers help to protect decking timbers from biological threats that would rot or degrade untreated wood. By far the preferred choice, provides a good level of protection and durability. The main benefit of decking oil over a decking stain or paint is that they will never crack, flake or peel. This means that you’ll never be faced with the difficult and potentially time-consuming task of trying to remove an old finish. When high traffic patches of decking start to look worn or tired, it’s simply a case of cleaning the area to remove any surface dirt or debris. Then re-apply a small amount of decking oil to the affected areas. Even when the whole decking area needs a re-fresh, simply clean then re-apply a fresh coat of oil to restore it to its former glory. Clear decking oils tend to enhance the natural colour and grain of the timber and give decking a ‘damp’ look. 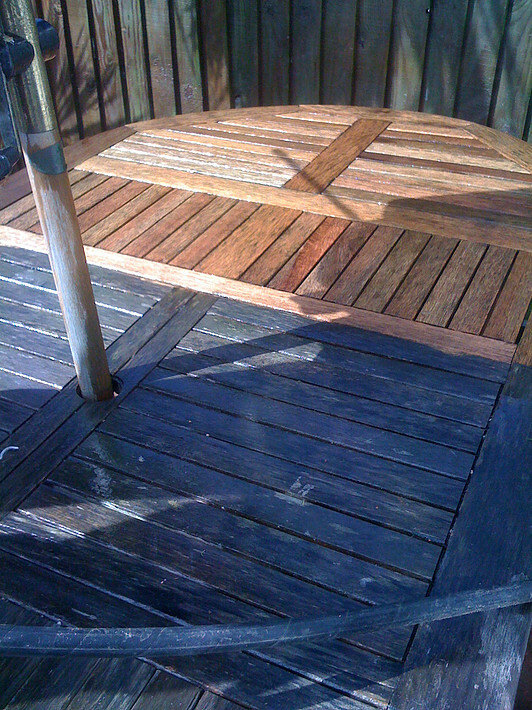 A way of testing how a bare wood decking will look once clear decking oil has been applied is to wipe over a section of the deck with a damp sponge or cloth. Coloured decking oils come in a variety of colours and shades. Although most people tend to go for a wood type colour such as Dark Oak, other colours like grey, black and white are available. Coloured products tend to provide better UV protection as the colour pigment in the oil helps to block the UV rays. Decking Stains provide a varnish-like coating on decking that still shows off the grain of the timber while introducing a colour to the deck. Available in a wide range of colours, decking stains are tough, durable and seal the surface of the wood. Potential drawbacks are that they can be more slippery than decking oils and eventually they will start to deteriorate and fail. When this happens there is often little choice but to remove the old product completely and redo from scratch. Decking paints produce a solid opaque finish on decking and can sometimes be used as a ‘quick fix’ solution to deteriorating decking stains. Available in a range of colours, decking paints, like stains, provide good durability but need more work when they start to crack and peel. If using paint on decking, be sure to use one that has been specifically designed for the job such as Decking Rescue Paint. Other exterior garden paints such as Cuprinol Garden Shades are perfect for garden sheds, wooden fences, garden furniture and other garden wood but are not durable enough for decking boards. If used on decking boards, the paint is likely to start showing signs of wear after a short period meaning that it will need to be re-painted or stripped back. Let us breath new life into your wood & restore it to its previous glory.